Joseph Main, third from left, former assistant secretary of labor for mine safety and health, and Patricia Silvey, center, deputy assistant secretary for operations with the U.S. 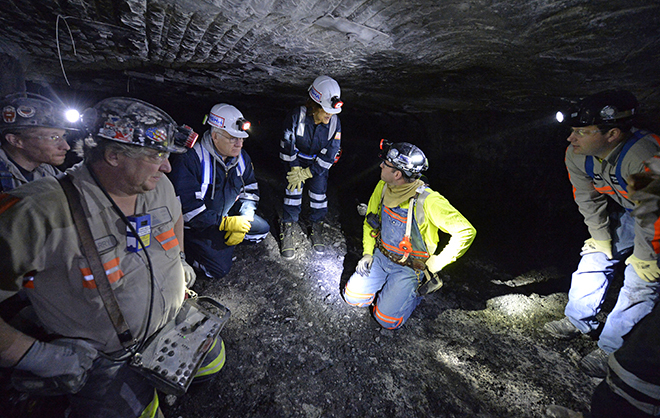 Mine Safety and Health Administration, speak with workers at an Indiana mine in 2015. U.S. 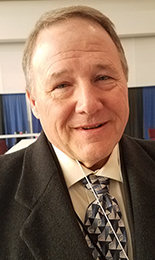 Mine Safety and Health Administration officials are working on a "One MSHA" initiative aimed at cross-training inspectors to enforce federal regulations at both coal and metal/nonmetal mines, but a former head of the agency said the two divisions are too disparate to be integrated. The categories are subject to different federal laws and have historically been separated. However, MSHA has begun "blurring the lines between coal and metal/nonmetal enforcement at operations where it makes sense," Assistant Secretary of Labor for Mine Safety and Health David Zatezalo said in January during a regular meeting where MSHA talks to coal industry stakeholders about safety issues. Tim Watkins, the former deputy administrator for coal, was recently appointed an administrator for mine safety and health enforcement, a new position that oversees both coal and metal/nonmetal enforcement. He said MSHA is using cross-trained inspectors at about 90 operations. "There have been no major issues reported," Zatezalo, a former coal mining company CEO appointed to the office by President Donald Trump, told the stakeholders. "We'll likely add a few more to this cross-inspection list during the year." The nation had 1,216 coal mines employing 83,053 people and 11,875 metal/nonmetal mines with 238,187 workers in 2017, the most recent year with MSHA data available. Although coal miners account for about a third of total mine workers, they often experience a higher rate of fatalities. In 2017, 15 miners died at coal operations while 13 died at metal/nonmetal operations. The many differences between coal mines versus other types — including physical structure, terminology, volume of produced material and miner health concerns — create potential challenges to an MSHA employee charged with inspecting both. Expertise is "still required for certain mines," according to a presentation MSHA prepared for an October 2018 industry event. "I wouldn't be doing that if I was running the agency," said Joseph Main, the assistant secretary for labor for mine safety and health under President Barack Obama. "One has to be really careful about how you start intertwining those two different sectors of the agency together. Sometimes, it makes sense to do those on a limited basis, but not to have people constantly crossing over from one side to the other as a norm." When coal mines were rapidly closing, MSHA trained extra coal inspectors to help out with a shortage of metal/nonmetal inspectors, allowing the agency to keep a reserve of coal inspectors in place so it "wouldn't get caught flat-footed" if the sector made a comeback and begin reopening mines. However, that was a temporary move and did not contemplate a broader merging of the two divisions, Main said. "Congress got it right [when] they created legislation for mine safety to have a separate coal and metal/nonmetal process in place," Main said in a Feb. 5 interview. "That was the right thing to do, to have administrative separations between coal and metal/nonmetal, and it should be continued." Speaking at the West Virginia Coal Symposium in January, Watkins gave an example of the issue MSHA is trying to resolve: the agency has to fly surface coal mine inspectors from Colorado or Wyoming to Alaska to inspect a coal mine when there is already an MSHA metal/nonmetal field office in Alaska. Using inspectors who are closer to the mine site can allow for more on-site inspection time, which can improve the safety and health of the miners at those operations. Watkins said the initial set of crossover mines are mostly "two- or three-person operations." "We wanted to start small; we wanted to start easy simply because we knew there was going to be a lot of training that had to take place with our inspectors, whether that be a metal/non-metal inspector or a coal inspector," Watkins said. "One of the things that we're doing when going forward is that when we hire an inspector, it will be a mine inspector. We'll be trying to do away with the coal terminology or metal/nonmetal distinctions. ... It's going to be a challenge."